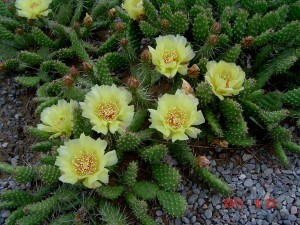 To see images of our Cactus plants, click here. Oval pads covered with very long spines , beautiful, slow, zone 5 , color? Few long spines on the top of the pad. Yellow flowers, big fruit. Dusty pink– beautiful , pink flowers, blooms profusely. Colour changes with age of flowers and light. Yellow “Tutu” – yellow blooms with little red, blooms profusely. Sorry-we cannot accept phone orders, COD’s, or credit cards. Plants will be reserved once full payment is received. Shipments are made from May to September, depending on weather. We like our plants to be fully filled out from their winter dehydration before we ship them. All orders will be shipped by Canada Post-XPRESSPOST, at the beginning of the week to allow for delivery before that weekend, we will contact you by phone or email to let you know when plants have been shipped. For larger orders, contact us and we will advise you of the shipping cost. Full payment is due with your order. Paypal, money order (payable to Anna Mizyn) or interac e-Transfer are our only terms- we do not accept COD orders. If for any reason, you are not satisfied with the cactus pads that you receive from Anna’s Perennials, please contact us immediately within one week of receipt of cactus. We cannot guarantee the success of plants after this point because there are too many factors beyond our control. Should you have any questions or problems pleased contact us via email or phone annasperennials@gmail.com or 705-799-0062. Opuntias will arrive as pad or stem cuttings. They should be placed in a dry, shaded, warm area to allow them to heal well. After that they can be planted. You can plant them in pots or directly in your prepared soil, ensuring the soil is well drained. Using kitchen tongs lay the pads on their side and press gently into the soil. Roots will form on the underside of the pad and give it a good start. Cacti should be planted in relatively dry soil and not watered in. They can be watered after a couple of weeks . Alternatively, stick the pad with cut end into the soil so that the pad is vertical. The danger in this is that the wound where it was severed from the mother plant could become infected with bacteria or fungus. Erwinia bacteria (potato soft rot) is the common pathogen of newly planted cuttings. Check for roots on the pads after opening the parcel, if they have already developed, plant that part in to well-drained soil immediately. All stock is in excellent condition on leaving our nursery. No warranty is made as to the productiveness of any stock sold. For PDF version of this page, click here.